Pupils at Fairlands Middle School in Bristol decided what they would change if they were world leaders. All pupils watched the videos on the Send My Friend website and then completed their own buddy. 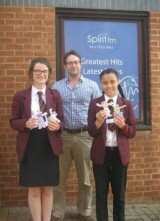 Pupils made a chain of buddies as part of the Send ALL My Friends to School campaign.